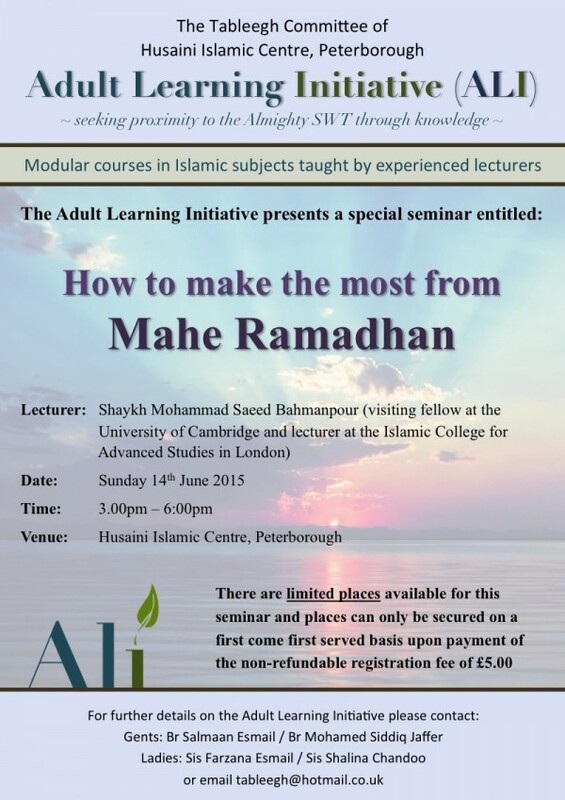 The Adult Learning Initiative (ALI) presents a special seminar entitled ‘How to make the most from Mahe Ramadhan’ presented by Shaykh Mohammad Saeed Bahmanpour on Sunday 14th June 2015: 3pm-6pm. There are limited places on the course and places can only be secured on a first come first served basis. To book your place please forward your £5 registration fee to the jamaat treasurer. For further details please contact Salmaan Esmail / Mohamed Siddiq Jaffer (gents) or Farzana Esmail / Shalina Chandoo (ladies) or email tableegh@hotmail.co.uk.